The complete annual fee for the following year can be paid in 2 installments. 1st Installment for super elite package is Rs. 4,00,000/-, elite package is Rs. 1,05,000/-, for pro package Rs. 95,000/-, for executive package Rs. 70,000/-, and for basic package is Rs. 50,000/-. Remaining fee to be considered as 2nd installment and to be paid after 3 months of 1st installment within 10 days. Any decision taken by the management will remain final. Player representation charge extra Rs. 10,000 per year. Fee once deposited, is not refundable and the players sponsor is liable to pay the complete annual fee for the following year. Rs. 24,000/- fee for only evening training for 1 year (Day Boarders). 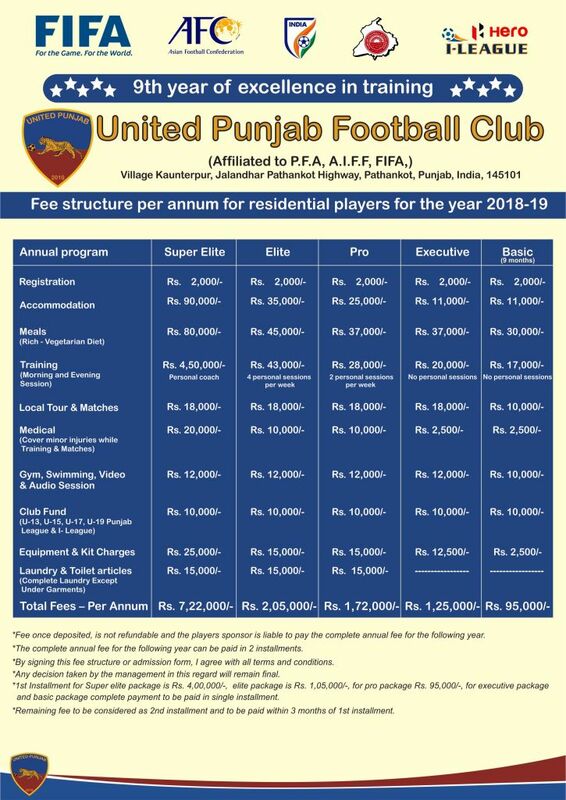 Members and Fans willing to contribute for the development of the Club may remit their contribution in the United Punjab Football Club Bank Account mentioned below. Branch: Dhangu Road, Pathankot, Punjab, 145001. Click Here to download the admission form. Send us an e-mail along with this admission form followed by instructions given above.